The stem increases in thickness In secondary growth. Secondary growth increases the vascular tissues. Therefore, it increases the thickness of flue stein. Secondary growth is common in gymnosperms and woody dicots. But it is generally absent in most of the herbaceous dicots and monocots. Seeondary growth includes the formation or secondary issues and periderm. The fascicular cambium is present between cell xylem and phloem tissues. The vascular cambium of the bundles is not contintious with adjacent bundles. The parenchyma cells of the medullary rays are present in between the fascicular cambium. The parenchyma cells of medullary rays become meristematic. They form strip of interfascieular cambium in medullar rays. The strips of fascicular and interthscicular cambium join together laterally to form a continuous cambium ring called vascular cambium. 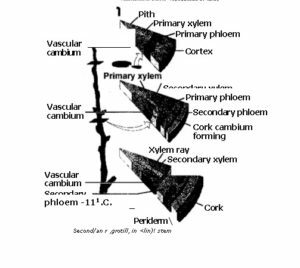 This vascular cambiurn form secondary xylem and phloem. The cambial cells have different morphology from the meristematic cells of the apical meristem. The cambial cells are highly vacuolated. They are of two forms. (a) Fusiform initials: They are wedge like. They are many times longer than broad and have pointed narrow ends. Therefore, these cells are rectangular in transverse section. The derivatives of the fusiform initials tossards the inner side differentiate into secondary xylem and those toss ards outer side differentiate into secondary phloem. (b). Ray initials: They are nearly isodiametric. They are found in vertical rows. The derivativeses of as initials give rise to rays. Secondary xylems are produced towards the inner side. It pushes the primary xylem bundles towards the centre. Ultimately, the pith is completely filled with the secondary xylem and primary xylem elements are crushed. The secondary xylem in dicots consists of an axial or vertical system and rays. (a) Axial or vertical systems: These xylems have vessels. some tracheids, fibres and axial parenchyma. (b) Ray system: The horizontal or ray system consists of files of parenchyma cells. They run radially along the whole length of secondary xylem and secondary phloem. The ray may be uniseriate or multiseriate. Uniseriate is single cell wide. Multiseriate is many celled side. The margins of multiseriate rays are always one cell wide. New rays are continuously produced in the secondry xylem and phloem. 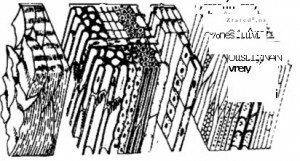 (a) Sap wood: The narrow peripheral functional part of the secondaryxylem is called sap wood. (b) Heartwood: The major central nonfunctional part form, the heart wood. The elements of the heartwood undergo certain morphological changes. These changes include deposition of tannins and lignification of their wall.Sometimes, the adjacent parenchyma cells migrate into the lumens of empty vessels. It forms outgrowth called tylosis. The activity of the vascular cambium is not- of uniform throughout the years in many plants. The cambium is most active during the spring. It produces wide and loosely dispersed tracheal elements. It is called spring wood. The activity of cambium slows down during the autumn. It produces narrow and closely placed tracheal elements. It forms autumn wood, This difference of spring wood and autumn wood produces annual rings. Annual rings can be seen in the transverse section of wood. These rings help in the determination of the age of trees. Secondary phloem also consists of the horizontal or ray system and vertical or axial system. (a) Ray system: The characters of rays are the same as in the secondary xylem. (b) Axial system: The secondary axial system contains sieve tubes.companion cells and phloem Parenchyma. New phloem elements are added each year. It increases the circumference only.Therefore. the layer of secondary phloem never becomes very thick. The secondary phloem of previous ions years k peeled off with the bark of the periderm in many plants. cork cambium has a simple structure. It is composed of a single type of cells. The cells are rectangular. They form a continuous sheet or cylinder. These cells divide to produce radial files of cells on the inner and outer sides. Cork or phellem: The cells produced towards the outer side develop into cork or phellem. The mature cork cells are compactly arranged. Cork has dead cells with out any intercellular spaces. Suherization of cork cells occur. Suberin is a fatty substance. It makes the walls of cells less permeable. The walls of cork cells become brown or yellow in colour. The cork is light in weight. It is impermeable for water. It also has thermal properties. Formation if harkI he activity, of the cork cambium or phellogen is seasonal. annual or periodic. Its activity depends upon the environment. As the trees become older, new layers M. cork cambium arise in the deeper lasers. It isolates the older periderm tissues ‘towards the outer side. This older dead periderm containing phellogen. phellem and phelloderm is called bark or rhytidome. Bark is continuously ruptured and formed.